From radiology and anesthesia to patient needs and client education, this handy full-color guide covers everything students need to know about veterinary dentistry! Dental procedures are presented first, with chapters on oral examinations, instruments, safety, and anesthesia, followed by coverage of more difficult areas such as endodontics, radiology and periodontics. The book concludes with two very interesting chapters on marketing veterinary dentistry and commonly asked client questions, replete with proper responses. 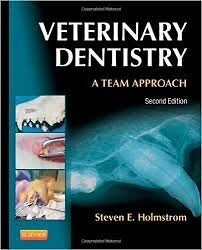 With its comprehensive coverage and team approach, Holmstrom's text is the ideal resource for both vet tech and vet students to quickly master the art of animal dentistry.